This large, life size camel prop is a perfect addition to Middle Eastern themed events. He is friendly and loves to party! 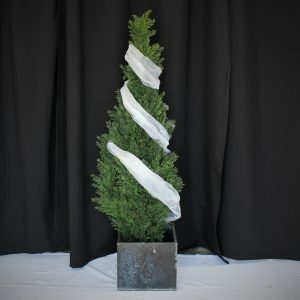 We have a range of Christmas trees available for hire and can be dressed in different themes. Our DIY Fairylight Curtain System is 3m x 3m and is an adjustable system. These are $199 each and include the auto poles, the fairy lights and the curtains. Curtains are available in black, white and silver. We can do other colours – pricing on request. We can customise and decorate your photo backdrop as you like, just give us your ideas and inspiration and we will make it happen! This canopy is ideal for Turkish, Arabian and Middle Eastern themed events. It creates a ceiling cover of just over 4 metres. If you let the material drop like a mosquito tent it will hang 2 metres down the sides. Easy to set up. Ask about our other props which are suitable for this theme. Put the ‘vintage’ in your wedding or event with these pretty vintage teacups, saucers, crystal vases, cotton linen , silver teapots, milk bottles, phones and more. Perfect for wedding and event signage, seating plans, candy buffet displays and photo booth signage. Available in various styles and sizes. Ask about our easels and stands available. Guaranteed to make your photos stand out from the rest, this trike is fully operational and can also be used as a prop for photo shoots. Create a memorable vintage theme with this one of a kind gramophone. Perfect for creating unique wedding photos and fun photo booth ideas. Add some vintage style to your wedding or event with some cane vintage picnic baskets. Great to display photos or for photo booths. The singer sewing machine is a great vintage prop idea for weddings, events and photo shoots. Hire the singer sewing machine with case for $20. Add the singer treadle table for just $15. Vintage telephones are great to set the scene for themed events. Available in different styles. Vintage typewriters are great to set the scene for themed events. Availaible in different styles.